This USB digital microscope allows you to see the smallest details in high resolution directly on your computer screen. It&apos;s suitable for industrial inspection, electronic accessories inspection, skin examination, textile inspection, jewelry inspection, collections/coin inspection, printing inspection, and so on. 1000X magnification, perfect for you to see the smallest details. 0.3M CMOS sensor is great for high resolution images of your specimens. The USB microscope can be connected with your computer via the USB port Windows, Mac, no need for extra adapter. Built-in 8 LED lights and the brightness is adjustable(a wheel on the cable). Adjustable 360° metal stand is great for hands-free operation and multi-angle observation. 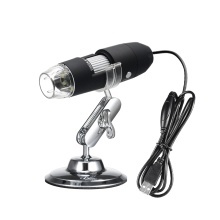 High quality USB digital microscope which you can use to snap HD pictures and capture Video. Allow you to see even the smallest of details. Suitable for industrial inspection, computer parts inspection, scientific teaching tool, insect/plant/skin/scalp examination, textile inspection, jewellery inspection, collections coin inspection, printing inspection and so on. 1. Don&apos;t disassemble the product in case that the electrostatic break the precision chip. 2. Remember to pack it in a box after use, otherwise dust will be easy to get in. 3. Don&apos;t touch the lens to avoid surface scratches and dust.